Poplar is near the centre of the old East End of London. Located just north of the Isle of Dogs, that long lazy loop that the Thames takes as it begins its meander from London to the sea. There lie the East India docks, the most famous of the large docks of London. Now shadowed by the towers of the Docklands financial district, you only have to cross the East India Dock Road, still one of the major arteries east of London, to enter into a timeless world of people who have always existed in the margins of society. They've been left behind by the fast flowing currents of global finance, but once the people of this area provided the numerous and anonymous labour for the shipping trade that powered the British Empire. So, Theresa May has gone to her first G20 summit in China and responded to all questions about the UK's planned leaving of the EU with the appropriately inscrutable statement that "Brexit means Brexit". Which, as more than one commentator has noted, may be the "what", but isn't an answer to "how". The problem is that the UK Govt doesn't yet know what it wants so can hardly formulate a plan to achieve it. Brexit covers a multitude of positions, some achievable, many closer to fantasy. Until the govt decides where the limits of the possible and desirable overlap, "brexit means brexit" is not repetition for emphasis, it's just a meaningless twice over. How have the Labour left, from arguably its lowest ebb in the party's history, apparently ended up on the brink of taking the leadership on a wave of support? If you listen to many self-described "centre-left" voices, it's because the Labour party has gone quite, quite mad. Cod psychology now abounds to describe the rise of Corbynism: narcissism, people wanting to show off how right-on they are on Facebook, mass delusion, an emotional spasm, and so on. Corbyn supporters are having a temper tantrum against the electorate, so this patronising narrative goes, they think voters have "false consciousness" on a grand scale. Some sort of mass psychological disorder has gripped one of the great parties of the left in the western world, and the only real debate is how it must be cured or eradicated. And the tragedy is this: the great "centre-left" condescenders are able to identify any factor for Corbyn's spectacular rise other than the culprit: their own political cause, or rather its implosion. Some of these commentators huddle together on social media, competing over how snarky and belittling they can be towards those oh-so-childish/unhinged/ridiculous (delete as applicable) Corbynites, unable to understand that rare thing, the birth of a genuinely grassroots political movement. And that's the problem: this snarkiness is all some seem to have left. Much of the self-described "centre-left" - I'd say Blairism, but some embrace the label more than others - now lack a clear vision, or a set of policies, or even a coherent distinct set of values. They increasingly define themselves against what they regard as a deluded, childish left. They have created a vacuum and it has now been filled by the Corbyn left. However I want to make a stab at a slightly larger question : Why Corbyn, like Bernie Sanders in the US, is managing to attract such enthusiasm from all quarters of political opinion except the gate keepers and agenda setters of the professional commentariat. Clinton famously had a sign on his desk that read "It's the economy, stupid!!". And he was right, but the follow-on question that always needs to be asked is "what economy?" or, more precisely, "whose economy?" The BBC technology chief who oversaw a disastrous project that wasted £100m of licence fee money is suing the BBC after it ended his employment. John Linwood was suspended as the BBC's £287,000-a-year Chief Technology Officer in May when the failed Digital Media Initiative (DMI) was closed down. His contract was ended in July 2013 and he was not given a pay-off. The National Audit Office reported today on how BBC bosses failed to react as the fiasco developed: "The BBC executive did not have a sufficient grip of the programme and did not appear to appreciate the extent of the problems until a late stage." A New Left Grouping ? But the truth is that Britain urgently needs a movement uniting all those desperate for a coherent alternative to the tragedy of austerity, inflicted on this country without any proper mandate. That doesn't mean yet another Leninist sect, lacking any semblance of internal democracy, obsessed with replicating a revolution that took place in a semi-feudal country nearly a century ago. Liberal conspiracy is a leftish UK Labour Party-supporting blog which I consider is pretty good and deserves support. It is, necessarily, focused on UK politics with just a hint of US colour, but very little european coverage. However, the editor and principal contributor, Sunny Hundal, has gone off to volunteer for the Obama campaign and those left in charge, recognising that footfall will be reduced if there isn't a decent turnover of diaries, have requested input from the readership. I have wanted to visit Cologne for a long time. Sure, it's a famous city with a famous cathedral da dee dah etc etc, (see next diary) but for a dedicated beer hound it offers something far more important; a beer style which, while related to the Dusseldorfer Altbier style, is unique to the area. I was going to do Cologne in one diary, but thought I should spread it onto two. So, touristy stuff in the nest one. Is the UK Coalition about to implode ? Now that the fallout from the failure of the Lords reform bill is being assessed, things are definitely becoming interesting in Westminster at the moment. There are too many strands for a comment or even a series of comments, so I thought I'd start a diary to see if the various plots can add up to a whole narrative. America may have invented rock and roll, but for 15 years after the Beatles came on the scene it had more or less belonged to the British. Even the great American Guitarist, Jimi Hendrix, had to come to the UK to be recognised as a god and conferred with honorary "Englishness". With Cream and Jimi showing the way, psychedelia evolved into heavy rock, allowing such creatures as Led Zeppelin, Deep Purple and Black Sabbath to emerge from the primeval swamps of the English midlands and begin their reign over the 70s (and the rain of televisions from hotel windows). Heavy Rock was British : Nobody was as loud, nobody was as rowdy and nobody rocked as hard for longer. American rockers just didn't have a clue. Or maybe it was just a case that they were there, but nobody was paying attention. For those unfamiliar with the radio show, DID is a radio institution which has been running for 70 years and each week the invited "castaway" is asked to nominate the 8 pieces of music, a book and luxury which they would choose to accompany them to a desert island. You also get the Bible and the complete works of Shakespeare. So, here's mine. The narrative could have been very messy, so many choices, so many options. I wrote down a few dozen tracks I could have chosen, and even then I was leaving out so many others. Yet, once I decided I'd just mark the ones that had to be in, I found that the selection of eight had made itself. Living through a collapse is a curious experience. Perhaps the most curious part is that nobody wants to admit it's a collapse. The results of half a century of debt-fuelled "growth" are becoming impossible to convincingly deny, but even as economies and certainties crumble, our appointed leaders bravely hold the line. No one wants to be the first to say the dam is cracked beyond repair. To listen to a political leader at this moment in history is like sitting through a sermon by a priest who has lost his faith but is desperately trying not to admit it, even to himself. Watch Nick Clegg, David Cameron or Ed Miliband mouthing tough-guy platitudes to the party faithful. Listen to Angela Merkel, Nicolas Sarkozy or George Papandreou pretending that all will be well in the eurozone. Study the expressions on the faces of Barack Obama or Ben Bernanke talking about "growth" as if it were a heathen god to be appeased by tipping another cauldron's worth of fictional money into the mouth of a volcano. But here's a thought: what if big ideas are part of the problem? What if, in fact, the problem is bigness itself? Middle Eastern dance has probably been enjoyed in the USA for as long as widespread immigration has existed, indeed we have documented evidence of public performances since at least the Philadelphia Centennial in 1876 as well as at the Columbian Exposition of 1893 (where, incidentally, no dancer called Little Egypt was recorded as having performed (2) ). However, despite several flurries of interest brought about by the activities of Orientalists such as Ruth St Denis and La Meri (3), for most of the first half of the Twentieth century the dance has been largely confined to those ethnic groups to which it was indigenous. There were large Greek & Turkish groups in most major cities of the USA and their cafes and clubs naturally featured singing and dancing amongst the entertainments. Marliza Pons, the doyenne of Las Vegas dancers from the mid 60s through to the late 90s, wrote of learning her first moves as a young girl through the windows of such an establishment in Chicago in 1948 (4). Whilst some of them would be locals, there was also a long tradition of hiring singers and dancers directly from Turkey. The singers would be the stars and would be the best-paid entertainers. Such was the pecking order that they would try to deny being able to dance to avoid the "shame" of being just a dancer (5). A generation of young British adults is close to giving up hope of ever owning their own place to live. A startling new survey reveals that while the great majority of young Britons from "Generation Rent" would like to become homeowners, most believe they will be unable to raise the mortgage they require to get on to the property ladder. A combination of continually rising house prices and pessimism about the future is threatening to send into reverse the explosion in home ownership stimulated by Margaret Thatcher 30 years ago, making Britain more like Europe, where living in rented property is the norm. Since last year's rejection at the polls, the British Labour Party have been in a gradual (glacially slow) process of re-invention and re-evalution. They have a new leader and now every policy stance is up for discussion, after all, with the coalition in popularity-freefall the future of the country is theirs to grab. Labour has broken its traditional habit of responding to defeat with introspection and division. Partly spurred on by the common purpose of its coalition opponents, a sort of unity has broken out in the party. Paradoxically, while contributing to the party's current poll lead, this sense of unity may also be related to the perception of many voters that they don't quite know what Labour stands for. Although this carries obvious risks, in the short term party unity creates the space for constructive argument through which political definition can be forged. So now in furious bursts of activity various groups are coalescing around differeing themes for this argument, all neatly colour coded; there's Maurice Glasman's Blue Labour, there's Compass's Purple Book Labour and.. and.. well err, that's it. Yes, one year on and there's only two significant groups discussing where Labour goes next and both seem to be, well a little bit backward looking. Well, Ed Miliband has created the Labour Shadow Cabinet and viewpoints are still all over the shop. Which kind of makes the case for Alan Johnston. He is definitely of the Blairite Right. Both Ed Balls and Yvette Cooper are of of the left and both are perhaps too steeped in the minutiae of economics to really tell the wood of Opposition from the trees of individual policies. Plus there appears to be a widespread (ie all journalists agree anyway) that Ed Balls would be too bombastic facing Osborne, which probably says less about Balls than it does the trite cw of the media. and Cooper isn't trusted to be independent of her husband. Are The Producers remaking Bob Roberts ? Politics is an expensive business and nowhere is it more expensive than in the USA. Indeed, so expensive that the methods of raising money are legion and accepted. To some extent, it is similar to putting on a play in a major theatre; so many of your costs are upfront and have to be paid far in advance of any possible income. Most plays lose money, but the hope of striking it rich drives people on. As Clive James once wrote, "there are two types of money in pop music, less than you'd think and more than you can believe". However, there is another way of making money. As was the premise of the film "The Producers"; over-sell shares so that the play was massively over-capitalised, but for a production that will close on Opening Night. No one audits the books of a play presumed to have lost money, thus avoiding a pay-out and leaving the crooks free to walk away with all the seed money. Last night, in the OT, I linked to some pithy criticisms of the perceived lack of achievement by the Obama administration. This led to an interesting discussion and Izzy kept coming back to a single question, "What good does it do to keep criticising Obama personally ?". It's a fair question and deserves a considered answer. But it's different for Obama, they believe in him: And he can't deliver on those expectations; nobody really could, but he won't even try. Items already announced, such as a bigger military really will make things worse. And where do progressives go then ? It isn't despair that hurts; you can live without expectations. It's hope that will break you, every time. Fran noted at the Paris meeting that ET-ers are mostly all of "an age", not necessarily how many growth rings are in our heads, but a seen-it-all-before, won't-get-fooled-again attitude that looks at politicians with a hard-eyed reality. It was her observation that, conversely, Obama supporters, those who truly bought "the audacity of hope", are the ones who are most fired with enthusiasm and are consequently the ones must susceptible to disillusion. Not so long ago I wrote about the London Drinker beer festival to give some idea of what goes on at a regional festival. 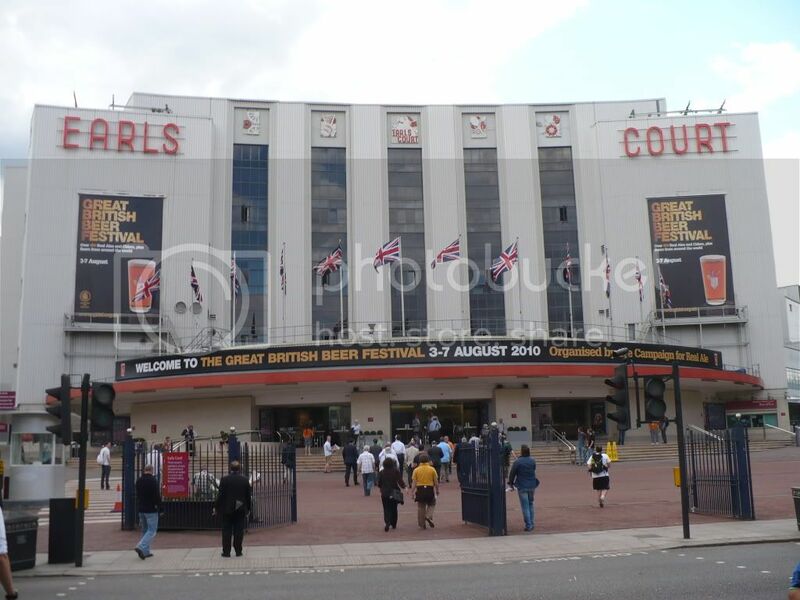 So it was inevitable that I document something of the big one, the Great British beer festival. To give you an idea of the scale, the American bar had 100 different US beers on draught (that's draft in American) from the cask. With the exception of the Great American Beer Festival in Denver, that makes it the largest selection of American beer anywhere. And that's just one of the bars. Okay, seems it's time to create a mothership blog to contain our ravings and predictions. Everything kicks off with the hosts, south Africa playing Mexico on Friday June 11th and the hysteria continues until July 10th.